We’re celebrating the 40th anniversary of Roll of Thunder, Hear My Cry with a beautiful new edition of the book, out now. Regina Hayes, Editor at Large of Viking Young Readers, wrote this letter to commemorate the day. It is hard to believe that forty years have passed since the publication of Roll of Thunder, Hear My Cry. It seems like only yesterday that I met Mildred Taylor, when the manuscript that became her first book about the Logan family, Song of the Trees, won a contest sponsored by the Council on Interracial Books. Mildred was interviewing the editors who had expressed interest in her manuscript, and she came to our offices at Dial, a beautiful, shy, but very composed young African-American woman. Much to my delight, she chose Dial as her publisher, and I became her editor. After working with her on the first book, I knew Ms. Taylor had enormous talent, but I was still stunned when the manuscript for Roll of Thunder, Hear My Cry arrived: a hugely accomplished, compelling, full-fledged novel with an unforgettable cast of characters. Reading it, I had shivers up my spine. Could it really be as good as I thought it was? But subsequent readers confirmed my judgment. There was such excitement in the office around publication. We firmly believed that this was an important book, and our faith was justified when the Newbery committee chose Roll of Thunder, Hear My Cry as the most distinguished contribution to literature for children that year. Today. generations of readers have agreed as they embraced the Logan family saga. 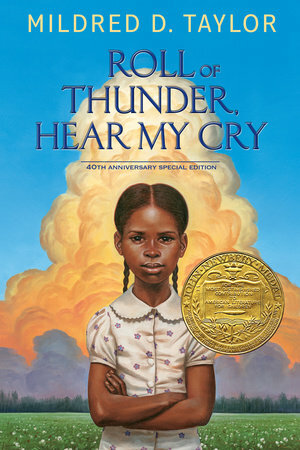 To celebrate the occasion, the wonderfully talented and award-winning Kadir Nelson has agreed to create new covers, not only for Roll of Thunder, Hear My Cry, but for all nine of Mildred Taylor’s books about the Logan family, which will be reissued throughout the year. Mr. Nelson’s work has been featured in numerous different outlets, including The New Yorker, a United States postage stamp, a Michael Jackson album cover, and numerous award-winning children’s books, and his rich, inviting paintings are the perfect complement to Mildred Taylor’s heartfelt stories. And something more to look forward to: 2017 will see publication of the final book in the saga of the Logans, which follows Cassie Logan through the years after World War II, as she attends law school and becomes involved in the momentous years of the early civil rights movement. I hope you will join all of us at Penguin Young Readers in the year-long celebration of a ground-breaking writer, her memorable, moving books, and forty years of courage, love, and pride.